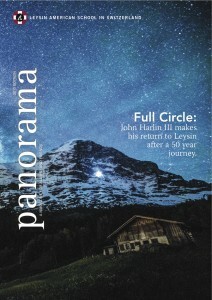 Attached is a PDF copy of the Leysin American School’s Panorama magazine 2015 story “Full Circle,” which describes the Harlin Family connection to LAS from 1963 to 2015. By far the best parts of the article are the letters from Bruce Bordett and Carol Fallon. As former high school students of my parents, they wrote these letters in 2005 to help with my book, “The Eiger Obsession: Facing the mountain that killed my father.” The letters were important there, but weren’t given their full due, so I’m absolutely delighted to have been able to publish them here in near-full. A few days ago I reread them with tears flowing down my cheeks. I don’t think my mother has ever been honored so well for that period, where Dad has taken all the attention due to his climbing. These letters finally give my mother her due. I hope you agree. You can also read about the two projects I’m responsible for here, The Duke of Edinburgh’s International Award and the GLOBE Program for science. © 2019 John Harlin Projects. All Rights Reserved.